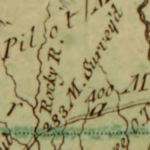 The horizontal darker green line is the southern boundary of the Granville District and the “283 M. Survey’d” annotation indicates the distance covered by that survey from its origin on the Outer Banks. On the image below, the red X marks the location of that annotation. So, exactly how accurate was the mid 18th Century survey of the Granville Line? 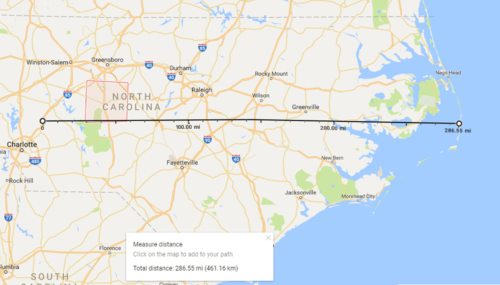 According to Google maps, the distance is 286.55 miles. One could reasonably argue that the 3+ mile discrepancy is due to poor cursor placement on my part and that the original survey was spot on! Corrections? Comments? Please use the “What’s on your mind?” comment box below. A map of the British and French dominions in North America... by John Mitchell. This entry was posted in 18th Century, Boundaries and tagged Granville District, John Carteret, Lord Granville by crmaps. Bookmark the permalink. It is more likely that the moving barrier island chain on the Carolina Coast made a geological repositioning from 1749 when the survey was done until Google landed on this same segment of the earth’s firmament! That’s also why we don’t know where William Byrd, Edward Moseley et al. started on their dividing line a few years earlier.